What's wrong with Google? - tech talk - Furtopia | Family Friendly Furry Forum and IRC Chat! I've noticed the following last night as well as today. I'll go to the main Google search page --> www@google(dot)com and then enter something in the search bar to start searching. But after I hit the Enter key, I then get a blank page. No website links or anything else shows up. What the heck is going on? Re: What's wrong with Google? Sorry your having problems. I just tried it and got results. If google is letting you down try using Bing. What browser and device are you using, Kobuk? When you say that the resulting page is blank, do you mean that there's no content aside from whiteness in the area where the browser would otherwise display the webpage, or do you mean that it looks more like this? What URL is shown in the URL bar when you see the blank page? Do you have an antivirus running on your machine, and has it recently complained at you about a possible infection? There are apparently a number of things that can cause what you're talking about, hence the battery of questions. I'm using a regular desktop computer with Windows 10 on it. I have Mozillia Firefox. The link you gave is pretty much what I am getting (minus all the colored stuff at top) every time I try to do a search for something. 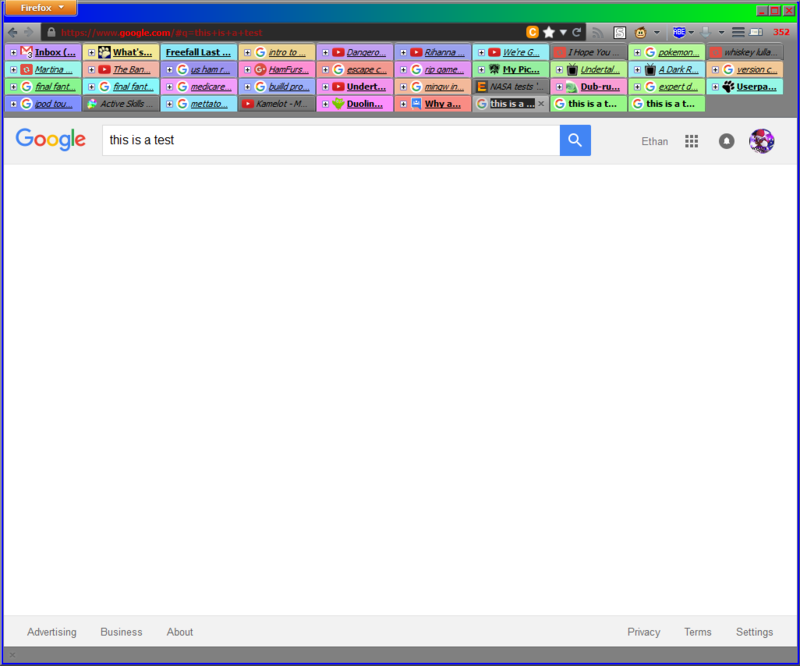 The array of colored tabs at the top are a part of my own browser setup; the part that I was asking about was whether you have the bars at the top and bottom of the browser window that contain, among other things, the text box from Google's search page containing the entered search terms. I've been able to partially reproduce what you've been seeing. On my end, I see expected behavior for searches made from Google's home page, searches made from the browser's URL bar, and opened links to Google searches. However, certain manipulations of a Google URL (for instance, opeining "https://www.google.com/?gws_rd=ssl#q=fruit" in a tab and then manually changing that URL to "https://www.google.com/?q=fruit") seem to generally produce the behavior that I took a screenshot of. When I come across this issue, though, I've been able to work around this issue by clicking the text box containing the search terms and pressing Enter (the search results then appear, as they should have in the first place). Does that work on your end? Well, what do you think this is: A problem with Google on their end? Or a problem with my browser on my end? Come to think of it, this started happening to me too, a LONG time ago, when I had a Windows XP desktop with a completely full hard drive that was about 10 years old. No matter what I did, I couldn't use Google on it, so I ended up using Bing until I got a new computer. Sorry this isn't much help, but it struck me that you are basculy getting the same problem as me but on a new PC. could try messing around with the addons/plugins on firefox. iv had those really mess up firefox in the past, though mine seems to be running fine now. I am using win 10 with firefox, and I have no trouble using google, or any search engine. Also try doing a refresh when you get a blank page. Sometimes that helps with page problems. changing browser works, try resetting the browser to factory settings. Or look at the security settings on it.